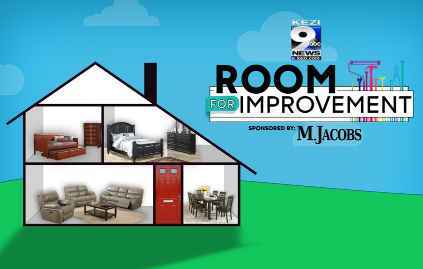 KEZI 9 News has teamed up with M. Jacobs to brings you the KEZI Room for Improvement Contest where they are giving you an opportunity to win an amazing $5,000 Room for Improvement prize package with a professional designer from M. Jacobs. Participants must watch KEZI 9 News This Morning from 6:00-7:00 a.m., weekdays from July 2, 2018 to July 25, 2018. During the show look for the special Room For Improvement contest codewords. Once you have acquired the code word then visit www.kezi.com/contests and follow the online instructions to register by entering all information requested on the registration form including correct Room for Improvement Contest code word on the contest page. Prizes: One (1) Grand Prize Winner will win one (1) consultation from a professional designer from M. Jacobs, and new furniture and accessories from M. Jacobs for one room. Total ARV of Prize package is: $5,000. Who Can Enter: The contest is open only to open to the general public who are twenty one (21) years of age or older at the time they enter the sweepstakes and a legal resident of the Promotion Area (above) to be eligible to win. When To Enter: The KEZI Room for Improvement Contest entry begins on July 2, 2018 at 5:00 a.m. Pacific Time (“PT”). Entry deadline is July 25, 2018 at 12:00 p.m. PST. Who’s Sponsor: The contest is sponsored by Oregon TV, LLC d/b/a KEZI 9 News (“KEZI”) and M Jacobs.